Italy is high up there on my bucket list, but I know that it will take some extra effort to get there. In my true planner style, I’ve already mapped out what an adventure there would look like. But there is one destination in Italy that I would want to focus on for one trip: Sicily. As an island, it makes it a bit more complicated to hop around to other places and I’d rather just enjoy the holiday there to the fullest. When I think of Sicily, three main things come to mind. 1. Food, 2. Gorgeous weather, 3. Authenticity. (Geography major here kicking in – due to the number of people and cultures who have left their marks on Sicily- that has to have left a unique feel for the island). Cefalù, Sicily in particular, it seems, has it all. 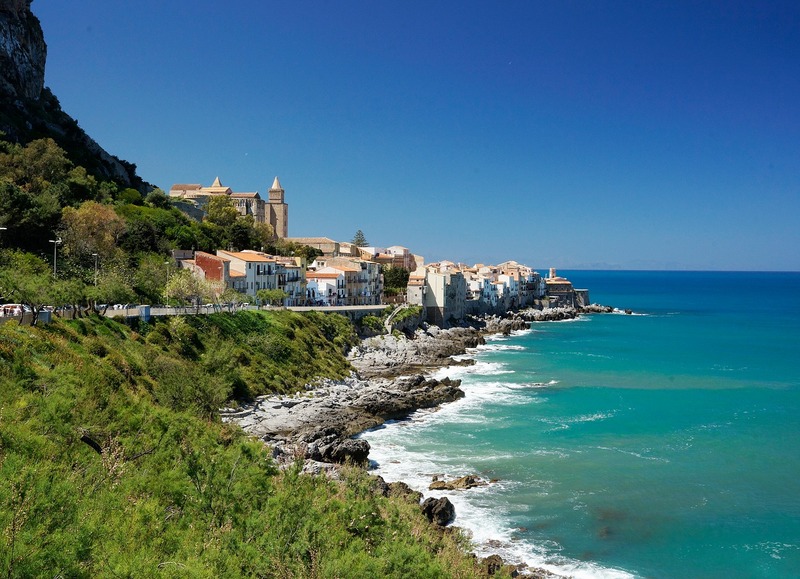 Cefalù is a beach town tucked away on the northern coast of Sicily facing the Tyrrhenian Sea. I would love to rent out a private space, like one of the many villas in Cefalù that are listed on Wishsicily for example, settle in and experience all that the area has to offer. So how do I plan to spend my future time in Cefalù? Sicily is an island, after all! Most of my time, most likely, will be spent down at the turquoise water. The coastline along Cefalù is gorgeous, with fine golden sand, which is not always a guarantee in Sicily. In many coastal towns, access to the beach is not always easy. To get to Il Lungomare, the 5 kilometre beach at Cefalù, it is just a short walk from the town AND easy to get down to. The water is also not too deep! La Rocca, or the “Rock”, is what you first notice about the town. That big of a large rock formation is sure to catch your attention. It is situated just above the village. There is a path that you can follow up 290 metres to the top, with a view of the coast as your reward. At the top of La Rocca, there are thought to be the ruins of a 13th century castle, the Cefalù Castle, which protected the town and harbour. At the base of La Rocca, there is the Cathedral that was constructed in 1131 under the rule of the Norman King, Roger II. The craftsmanship of the Cathedral is absolutely spectacular, so after wandering through it, sitting outside in Piazza Duomo and enjoying the view with a coffee or gelato in hand is a must. The Santuario Gibilmanna is a religious shrine and pilgrimage destination positioned 800 metres above the sea. You can read all about its history here. This time of year would be especially wonderful in Cefalù. With it being the off-season, the weather is more comfortable, prices are lower and tourism has slowed down – a wonderful combination for an island adventure in my books. "Am I late to the party? Urban Decay All Nighter Setting Spray"
"7 Reasons why I’m excited for Autumn"